Long has the snake oil salesman promised miracle cures, vast fortunes and spiritual curiosities on the odd chance he could trick the most gullible among us into lining his own pockets with gold. And the most talented conmen provided exotic and expressive storytelling, music, and oratorial performance to seduce these poor citizens to suspend their disbelief and follow them with their wallets wide open. But alas, like the Wizard of Oz before them, eventually they get found out and chased out of Kansas, only to set up shop again in a different town, with a different story, yet with the same snake oil that either caused physical or financial harm, and in the best case scenarios, didn’t do much of anything at all. And eventually, when things aren’t going so well, some of them just pick up and head down to the border hoping to avoid the realities of civilized society, the FDA, the FCC, and the long arm of the law. So while the Mexican border, outlandish behavior, and truth in advertising are certainly on everyone’s minds right now, it’s interesting to examine the outlaw days of border blaster radio and its cultural implications in terms of a search for unregulated markets, invented personalities, freedom of expression and its borderline relationship with propaganda. The Texas-Mexico border has now become synonymous with divisive, phantom, illicit immigration and drug cartel violence, but this too is just modern day propaganda. Although the border is a hot topic among Americans nationwide, for those residing in border cities, immigration is not a major cause for concern. And at one point in time, it had some of the most innovative radio technologies and radio personalities in the country. The first of these personalities to arrive at the Rio Grande in the ’30’s was a seemingly ingenious, medicine-practicing Kansas conman named John Romulus Brinkley. The border radio operators were pushing back against the revocation of broadcasting licenses by U.S. authorities due to the consequences of their unscrupulous practices on the radio. So, many of them fled to the border for radio salvation. Prior to 1920, Brinkley developed a “cure” for prostate issues, male impotence, and male virility. The process required the transplanting of a goat gland into a man’s scrotum. Unsurprisingly, there were many fatal accidents. Eventually, Brinkley was chased out of Kansas for his fraudulent methods and began searching for a new locale to ply his trade. The border offered an intriguing option. He could promote his cures via radio from Mexico, the land of “big” wattage, and conduct shady medical operations and sell promoted items from Texas. In 1931, he was granted a radio license from the Mexican government launching the most powerful station on the border, XER (subsequently changed to XERA) at 50,000 watts, but was soon allowed to increase it to 150,000, enabling his programming of preacher sermons, hustlers trumpeting their goods, and hillbilly music to be heard over a wide swath of America. To put the power of 50,000-150,000 watts into perspective, KIIS, arguably the most popular radio station in the greater Los Angeles area today, broadcasts to 1 million listeners in five counties and transmits at only 8,000 watts. But in Mexico the low end power of a station back in the day was already 50,000 watts so that it could potentially reach people across their entire nation. Broadcasting in the 1930’s (until they were eventually shut down 1980’s), border radio was facilitated by a string of high-powered Mexican radio stations known as border blasters. Strung along the US southern border from Nuevo Laredo all the way to Tijuana, these dynamos of the airwaves advertised an array of products and services such as life insurance, fortune telling, diamonds, religious paraphernalia, autographed pictures of Christ, as well as music not readily available to listeners outside of the local communities where they originated. Brinkley achieved commercial and radio success during the ‘30’s, but by 1939 his schemes had begun to unravel when he lost a libel lawsuit to Morris Fishbein, the editor of the Journal of the American Medical Association. His loss initiated an onslaught of lawsuits against, him forcing the goat gland doctor to file for bankruptcy. He died broke in 1942. Brinkley’s brazen methodology and cavalier attitude emboldened other matchstick men to camp out and chase the wind from the border, employing questionable or even nefarious means to further their enterprises. Like the Glenn Becks and Alex Jones’ of today, these radio shock jockeys enjoyed espousing beliefs, both anti-Semitic and anti-Catholic, on-air while framing them with a healthy dose of snake oil commerce. By the late 1940’s, the charlatans had become dead air and replaced with more music-oriented radio shows, however, the products and preachers still remained an important ingredient of the programming. 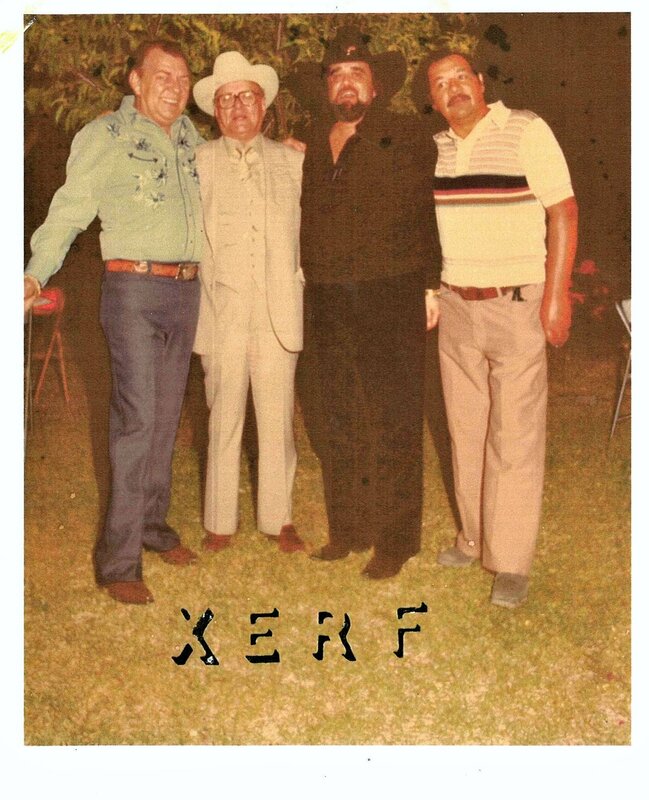 The gem of the border was XERF, which had previously belonged to Brinkley under the call letters XERA (the XE in the call signs were issued by the Mexican government for stations operating in Northern Mexico). The power emanating from XERF, a border blaster in Ciudad Acuña, Coahuila, Mexico, was so strong that if one walked between the transmitter and tower with a light bulb it would illuminate, explained Judge Sergio González, whose father, Arturo González, purchased the rights to the station’s airtime during the late 1940’s. In time, the mighty station would push its programming to 500,000 watts of circular power where it could potentially reach millions of listeners worldwide. “The signal was 360. So, it would go to South America and go all the way up to New York, Canada, and then it would go into Europe,” González added. XERF, at 1570 AM, was a clear channel station, meaning it broadcast exclusively on a frequency without any interference from other radio broadcasting entities. There was a plethora of stations along the frontera: XEXO in Nuevo Laredo; XELO in Juarez; XEMO in Tijuana. But XERF’s towering power rose above them all. “The fact that it had so much power, which I’m sure they were at 500,000 (watts) for a good period of time, I think that they settled on probably about 100,000 later on, but my dad said he never knew for sure. Eventually they got up to 1 million watts,” explained Paul Kallinger Jr., a 25-year veteran of radio, whose father was a disc jockey at XERF during the 1950’s and ‘60’s. The 1950’s brought XERF out of the shadow of Brinkley’s lawlessness and into the musical forefront. Kallinger’s father, Paul Sr., was instrumental in popularizing country music through his program on XERF, which began in the 1950’s. In an effort to return to “normalcy” after the war, pop culture was regulated and censored all over the United States. Ricky may have loved Lucy, but in TV Land, they slept in separate beds. You were told Father Knows Best. And unless you were writing poetry in Greenwich Village cafés or coffee shops in San Francisco, you weren’t left with much choice but to conform. But where there are strict moral standards there are inevitably underground movements against them. Country music, still referred to as hillbilly music during that era, became influenced by rock ‘n’ roll during the ‘50’s and popped out of the popular music womb as honky tonk. However, record label executives didn’t find that it possessed as much commercial appeal as its rock cousin and were less inclined to get behind it. XERF helped change that by bringing honky tonk to the ears of millions of listeners. A slate of country artists took advantage of the border blasters potential. A seemingly endless contingent of legendary country music artists trekked down to the border to promote and perform their latest single: Hank Williams, Johnny Horton, Hank Snow, Webb Pierce, Johnny Cash, and Jim Reeves all blessed the station with person and song, occasionally or frequently. Paul Kallinger Jr. said many of the artists would come to Del Rio, stay at their house and then drive over to Ciudad Acuña to be on the show. Acuña, known as Villa Acuña in the 1930’s, and Del Rio possessed a geographical, cultural and familial relationship that made it simple for people to live in Del Rio and work in Mexico or vice-versa. This symbiotic situation was nearly ideal for the American radio operator who wanted to increase their station’s horsepower, or sidestep Federal Communications Commission regulations by broadcasting from Mexico, but still live in the United States. Interestingly, Paul Kallinger Jr. may have had Elvis Presley as a house guest too. He said his father received a call from Presley one day requesting to be on his XERF program after he heard Johnny Cash on it. “My dad said, ‘Sorry Elvis, we don’t allow rock ‘n’ roll on our show.” Even Elvis couldn’t get on the radio—yet. But soon after the ‘50’s came to a close and social change could be seen on the far horizon, along came a Brooklynite named Robert Smith, a man magnetized by the XERF sound. In 1960, Smith, now better known as Wolfman Jack, arrived in Del Rio, Texas with some east coast demos of past radio gigs and battled his way onto XERF, eventually becoming station manager and turning a profit of $150,000 per month. The Wolfman sold items and dreams like the former peddlers on border radio and included religious programming too, but he added a slot for a Spanish hour to appease the Mexican government as well as hosting a 90-minute country show. It was after midnight when the jazz, soul, rhythm and blues, and of course, rock, were rolled out. The New York DJ’s thinly disguised sexual innuendo coupled with a diverse format of rich and new music enhanced his popularity in a time of extreme censorship. “Wolfman Jack. Thanks to the wide-open Mexican airwaves, he and his followers started sending R&B, blues, all sorts of stuff, around the United States for the first time. The importance of that speaks for itself,” Brock wrote. After the 1960’s, the personality and character of the border blasters seemed to change. However, border radio and American radio had done their job, ushering in new ways of thinking and fresh expressions of creativity; the ultimate cultural paradigm shift. So while Mexico gained financially, America gained commercially and musically. Today, terrestrial radio is said to be thriving yet shrinking as well. One report will proclaim it is healthy as ever and another will declare it’s on life support. However, what seems to be clear is satellite radio, music streaming apps, and podcasting have launched terrestrial radio on a trajectory of possible irrelevance or obsolescence. Radio, in general, freed all forms of popular music out of their regional closets, allowing them to sail into the mainstream. Specifically, it took two countries without a highly politicized trade agreement to facilitate this historical act of culture. And arguably, border radio was the most profound airwave platform, because it enriched American life while operating without any boundaries.